Lieutenant General Brian A. Arnold is commander, Space and Missile Systems Center (SMC), Air Force Space Command, Los Angeles Air Force Base, CA. In that position he is responsible for managing the research, design, development, acquisition and sustainment of space launch, command and control, missile systems and satellite systems. With more than 6,500 employees nationwide and an annual total budget in excess of $10 billion, SMC is the nation’s center of excellence for military space acquisition. Arnold is the program executive officer for Air Force space and is responsible for the Air Force Satellite Control Network, space lift ranges, launch programs, the Evolved Expendable Launch Vehicle Program, the Space-Based Infrared System Program, military satellite communication programs, Navstar Global Positioning System programs, intercontinental ballistic missile programs and the Defense Meteorological Satellite Program in addition to other emerging transformational space programs, such as space-based radar. He is also responsible for managing a portfolio of space superiority system programs. Prior to his current assignment, Arnold served as the director of space and nuclear deterrence for the assistant secretary of the Air Force for acquisition. In this role, he was responsible for space and missile systems. He spent the majority of his career as a pilot in FB-111 and B-52 aircraft, serving as a squadron commander, wing commander and sub-unified commander. Arnold was interviewed by MAT Editor Harrison Donnelly. Q: On the 50th anniversary of the Space and Missile Systems Center, how do you see it, as you said recently, ‘forging the shape of military space in the 21st century’? A: We’re really proud to celebrate our 50th anniversary. The Space and Missile Systems Center traces its ancestry back to July 1954, when it was the Western Development Division just down the road from out present location in a small schoolhouse in Inglewood, CA. Our founder, General Bernard Schriever, was a great visionary. I hope that we can continue that visionary approach to the future. One key factor that will ensure our future success will be to continue to implement the guidance from the Space Commission that came out roughly three years ago, as well as address the improvement areas recommended by Tom Young’s panel, which just recently came through here. Our goal, as we forge the shape of the future of space for the 21st century, is to continue to provide the finest space systems on time, at cost, to meet our warfighters’ needs. A big part of that is to focus on providing the right capabilities and effects to our warfighters. It’s also important for your readers to know that SMC space programs, and the products and systems we produce here, have national and international implications for both the economy as well as the national security of our country. We need to continue to push the leading-edge technologies, use all the talents and expertise of our scientific, engineering and technical and administrative communities to meet the warfighters’ needs over the next 50 years. Q: Among the many valuable programs under your command, could you highlight a representative sample of some of the most important initiatives under way? A: One of the more important programs that really reflects innovation and looking far into the future is the Global Positioning System [GPS]. That’s become not only a U.S. military but also a U.S. national treasure and is in fact a worldwide utility. You can’t navigate in the air or on a ship, you can’t plow a field or deliver an accurate weapon nowadays without the use of the GPS. So that’s an absolute ‘gold star’ program that we’re extremely proud of. Today we are happy to say that we have the healthiest and most accurate navigation constellation this country has ever seen, with 29 GPS satellites in orbit. That’s a real shining example. In terms of our warning systems, which are the Defense Support Program [DSP], with the launch this year of the DSP 22, we have the healthiest warning constellation ever, and it is a big success. We’re very proud of that for its role in national warning and intelligence. We’re also very pleased with our MILSATCOM program, where we’ve launched the last of our MILSTAR satellites, MILSTAR VI, as well as the last of the Defense Support Communications Systems [DSCS] program. I think it’s safe to say that we’re very pleased with our Defense Meteorological Support Program [DMSP], with the launch of the DMSP F-16 satellite this year, which is now fully operational, providing unprecedented weather and environmental monitoring data for warfighters on the ground. In the areas of range and satellite control, we have a program called the Air Force Satellite Control Network, which continues to provide about 99 percent availability and reliability, with range access continuing to be 100 percent. Recently, we turned over about $183 million in upgrades to the ranges, and we’re very proud of that accomplishment. In the area of space superiority, we’ve done our initial operational capability with our Counter-Communications System. Finally, in the area of ICBMs, the fleet continues to be healthy. While it’s a mature system, it’s at a 99 percent alert rate. Topping all that off is the success of our launches. We’ve launched 38 in a row without a failure, and that’s huge. Typically in the past, the failure rate of major launches has been about one out of 10. So out of almost 40 launches, you’ve saved maybe four launches that normally might not have made it to orbit. That’s a lot of cost avoidance and it can be directly attributed to a strong focus on mission success and mission assurance by our entire team, including our industry partners as well. Q: What do you see as the most important technological challenges facing the SMC? A: Space is a very technically challenging environment to work in, and completely different from the air. One of the most challenging elements of our business is that once you build a satellite, you have to get it on orbit. It’s got to go through the launch to orbit, which is a rough environment, with a lot of acoustics and vibration issues. Therefore, you’ve got to test the satellite for that vibration; and satellites are fairly fragile systems to begin with. Then, once you do successfully get it through the atmosphere, it’s got to safely separate from the booster, after which you have to put the satellite in the proper orbit. Each of these phases presents many technical challenges. Ultimately, the toughest problem facing any of our programs is operating in the space environment. Once you’re on orbit, space is very harsh and unforgiving. So we’ve got to qualify each part to make sure it is going to work, because it’s binary—either it works or it doesn’t. You don’t have the opportunity to go up there and fix it. Unlike the airplane business, which I’ve been in for most of my career, you don’t do slow speed/high speed taxiing, and if you’ve got a problem, leave your gear down and come around and land. Once you light the fire on launch, it’s gone. It’s either you win or you lose. Therefore, a majority of our emphasis is in development right up front. Roughly 70 percent of our investment is in the development area, with 30 percent in operations & maintenance afterwards. The idea is once you launch, it pretty much takes care of itself, other than the ground control elements and the software updates we do to the system. This is what makes the space business very costly—upfront development to make sure these systems continue to work properly. Q: What is your vision of the Space Cadre, particularly in the area of space acquisition? 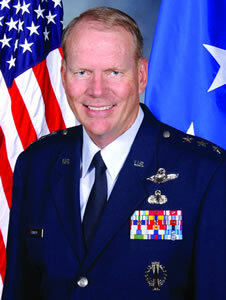 A: Under the leadership of General Lance Lord, commander of Air Force Space Command, we’ve really come a long way. In 2003 they published the Air Force Space Professional Cadre Strategy. General Lord’s vision is to build a team skilled and knowledgeable in the development, employment and integration of space systems concepts and doctrine, to achieve national security objectives. What they’ve done is to identify the Space Cadre members, which include the acquisition as well as the operational career fields. The idea is to track that experience, and once you begin to track it, to develop a continuum of core education programs as a person progresses throughout their career. That includes officers, enlisted and civilian cadres, so it’s all-encompassing. General Lord established a permanent, Air Force Space Command-wide Space Professional Management Office under the Mission Support Directorate in July of this year to help monitor and grow that space cadre. That’s really important, and I think that he has pushed hard to make sure our space acquisition professionals are part of that process, and we’re ever grateful for that. As you know, we need the technically experienced people, and also a broad range of operational-background folks to help manage our acquisition programs properly. Q: In discussing the work of the Young Commission in testimony before Congress, you referred to ‘unrealistic budgets’ and said that many programs were out of control in terms of cost and schedule. What are you doing to address this issue? A: The Young Commission, chaired by Tom Young, former Lockheed Martin chief, was chartered by the Secretary of the Air Force to look at both the National Reconnaissance Office and Air Force space acquisition systems and practices to include our budgeting processes. As part of that effort, the panel focused on three space programs: the Space Based Infrared Systems [SIBRS] High missile warning satellites, the Future Imagery Architecture intelligence satellites, and the Evolved Expendable Launch Vehicle program. What they originally found two years ago was that mission success was not rated as high as cost concerns. The report said the government went too far in its efforts to streamline program management by shifting greater responsibility for program success to the private sector—cost had become the overriding factor. Since that time, Mr. Young has come back to review our efforts and said some wonderful things in Young Panel number two. I suspect that we’ll probably see a Young panel number three as well, and we’re looking forward to that since I believe it’s good to have that kind of oversight. He recently shared some highlights of his one-year review findings. I’d like to quote a couple of things he said in his recent outbrief. First, he praised us for what he called an extraordinary cultural change that took place in only one year. He said, ‘Mission success is back as the primary focus for national security space programs,’ and this is ‘reflected in policy direction and leadership actions.’ Mr. Young continued by saying, ‘The reversal of this process is quite striking,’ and added, ‘There’s no question in our mind that mission success is back in the proper place as the driver for the program. This is a cultural change, and it’s quite extraordinary.’ As you can imagine, we’re very pleased with that feedback. Still, having said that, space programs will continue to be challenging by their very nature. As a result of a decade or more of acquisition reform and the Total System Program Responsibility [TSPR] concept, the military gave to industry responsibility for program development with oversight. As a consequence, the space community and space acquisition program have suffered. Under TSPR less government oversight led to less insight, and any initial cost savings due to manpower savings became cost overruns. We have eliminated TSPR as a process. Additionally, we’re working hard to improve our cost estimating capability here at SMC, building an organic capability so that when we start a program, we can take a deep dive and look at all the cost factors and cost elements. We’re looking at a higher confidence when we come out with our first estimate, using an 80 percent cost confidence versus the standard 50 percent. The other thing is looking at adding more management reserve to the kit bag of the program manager—somewhere around 20 percent management reserve to cover the unknowns you typically experience early in an acquisition program, particularly a space acquisition program. Q: What are you doing to address cost and scheduling issues? A: To help us address the out-of-control costs or schedules, we’ve instituted many things. One is using the Aerospace Corp. to engage with senior industry leadership on a more frequent basis. Another is deep dives in our management reviews. Now that I’m the PEO out here, we’ve revamped the way we do our program management reviews. We do them much more often than we did in the past. We’ve also instituted things called ExComs, which are executive committee meetings with the leadership of industry when we do have a program that has some kind of problem, for example on SIBRS. We’ve also really focused on benchmarking with our industry partners, where we do an off-site with the leadership of a corporation. We give them very frank feedback. In no other forum do we have the ability to provide that kind of feedback from the corporation to our program managers and from our program managers to the corporate leadership. We focus on program execution, we look at cost-schedule performance, and we look at management levels at the executive level as well as the program management level in the corporation. The feedback we get from industry leadership is that this is a fantastic forum. It’s shared privately and protected proprietarily, but this is an excellent forum to get through the big issues that loom out there. Of course, things like revamping our systems engineering are critical to successful programs. We have a fairly young cadre here, so part of it is educating them and making sure that they are very aware of the tools that they have to be able to do their jobs. Systems engineering revitalization is a big emphasis here. Q: What challenges are you facing in terms of managing requirements, and what are you doing to improve the requirements process? A: One of the biggest challenges we face as program managers is unstable requirements—the continuing shift or change in the needs of the customer or the mission requirements the system has to satisfy. What we’ve looked at is establishing a firm baseline from the get-go, and then making minor adjustments to that over time. As past studies have shown, a program manager is going to fail if he has unstable requirements and resources, and we want to give the program manager a fighting chance by providing him stable requirements. What we’ve done, again under the leadership of General Lord, is gone to this ‘urgent and compelling’ requirements process. Now we have instituted a process where once the program is baselined, if a new requirement emerges, we will look at it, see if the funding will meet the requirement, and asses the risk both from a technical standpoint as well as a good cost estimate to see when we could make an insertion of a new requirement into the program. It may just wait until we do the next revision of the software or a new spiral. That allows our program manager to work with a stable baseline, allowing your earned value management system to portray the real management productivity. It’s a very solid process. We’re doing it now on SIBRS, and we are starting in several other programs to do this urgent-and-compelling process. Again, in order for the program manager to successful, we need to be able to manage that baseline. Q: Cost and scheduling problems have been reported with the Advanced Extremely High Frequency program intended to replace MILSTAR. What progress have you made in developing that program? A: We successfully completed the Critical Design Review phase of the program in April of this year and we’ve started the production phase of satellites 1 and 2. It is true that we have incurred some slips, which will drive up the cost. The cost and schedule issues have primarily been driven by the delayed delivery of the Information Assurance [IA] and cryptographic products for integration into the satellites and ground stations. The Advanced EHF program is a pathfinder for a new way to do crypto, going away from the old ‘black keys’ to more of an electronic key management system. It has been challenging, but we’re working closely with our NSA partners to work out delivery of the crypto. At the same time, because of the slip, we’re working through a re-plan. We anticipate a slip of satellites 1, 2 and 3 in order to synchronize the satellite integration and the tests of the delayed-delivery crypto products. Q: Is there anything else that you would like to share with our readers? A: Space acquisition will continue to be very challenging and complex. It’s a difficult business—you have your fits and starts. But I think we’re putting a proper emphasis on the processes, the re-establishment of systems engineering as a standard. It’s important to come in with a certain set of standards—something we had gotten away from before. It’s very important for industry. These military standards are vital for proper program execution so industry knows what we’re looking for. We must continue to press the importance of properly training our cadre of space professionals. Mission success is our number one priority here at SMC—and our success is the result of rigorous mission assurance efforts. If we can continue to address our mission in a disciplined and prioritized manner, there is no doubt in my mind we are well on our way to successfully managing space acquisition programs. The goal is to provide the best capabilities and effects we can for the warfighter.